Jody Freeman is the Archibald Cox Professor of Law and the founding director of the Harvard Law School Environmental and Energy Law Program. She is a leading scholar of both administrative law and environmental law and has written extensively on federal agency regulation, climate change, energy and environmental policy, and executive authority. Professor Freeman’s book, GLOBAL CLIMATE CHANGE AND U.S. LAW (co-edited with Michael Gerrard) was published in 2015. Professor Freeman is widely published in leading American law reviews and in 2018 was recognized as the second most cited law professor in public law. 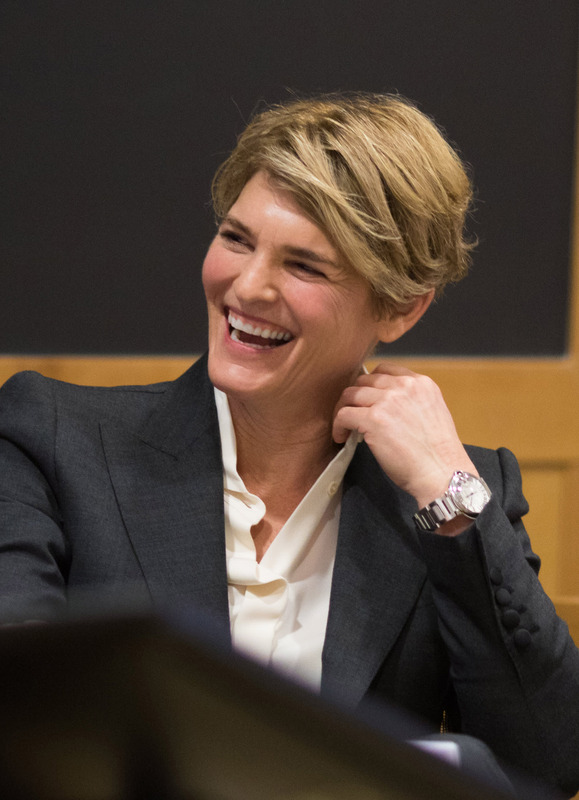 Among her recent work: her remarks at a special 2017 Department of Justice plenary on the Future of Environmental Law, (published in the Environmental Law Reporter) and her article, The Uncomfortable Convergence of Energy and Environmental Law(published in the Harvard Environmental Law Review). Professor Freeman served in the White House as Counselor for Energy and Climate Change in 2009-10, where she was the architect of the president’s historic agreement with the auto industry to double fuel efficiency standards, which launched the administration’s greenhouse gas program under the Clean Air Act. While in the White House, she also contributed to a host of initiatives on renewable energy, energy efficiency, transmission policy and oil and gas drilling, as well as the administration’s effort to pass legislation placing a market based cap on carbon. After leaving the administration, Freeman served as an independent consultant to the President's bipartisan Commission on the BP Deepwater Horizon Oil Spill. She was actively involved in defending the EPA’s landmark Clean Power Plan (the Obama-era standards to limit greenhouse gas emissions from the nation’s fleet of power plants), co-authoring, with her colleague professor Richard Lazarus, a series of responses to Professor Tribe on the rule's constitutionality, and an amicus brief supporting the CPP on behalf of former Republican EPA administrators William K. Reilly and William D. Ruckelshaus. She has since published several prominent critiques of the Trump administration’s proposals to roll back environmental protections, including the landmark vehicle standards and the Clean Power Plan. Professor Freeman has served as a member of the Administrative Conference of the United States, the government think tank for improving the administrative and regulatory process, and in 2011 was elected to the American College of Environmental Lawyers. She is also an independent director of ConocoPhillips, where she serves on the executive and director’s affairs committees, and chairs the public policy committee. In 2018, she was appointed to the Advisory Council of the Electric Power Research Institute, which advises EPRI on trends in political, economic and social issues that affect electric utilities to help guide its research and serve the public interest. Professor Freeman can be heard regularly on NPR, and has written for the New York Times, Wall Street Journal, Guardian, Los Angeles Times, Politico and Foreign Affairs. To hear professor Freeman's webinar on the transition from Obama to Trump in climate & energy policy, go here. For Inauguration Day interview with Professor Freeman about Trump's threatened environmental rollback listen here. For an interview with Professor Freeman on clean energy trends and incoming Trump administration, listen here. For an interview with Professor Freeman on Trump and renewable energy, go here. For a video interview with Professor Freeman on the potential impact of a Trump presidency on climate and energy policy go here. For Professor Freeman's interview with VOX on obstacles to a Trump rollback of energy/climate/environmental policy, see: http://www.vox.com/energy-and-environment/2016/12/7/13855470/donald-trump-epa-climate-regulations. See Professor Freeman's immediate post-election analysis of what Trump can and can’t do, including limits on executive power to unilaterally undo the Paris Agreement and key climate rules here. Professor Freeman debates whether "EPA has gone Overboard” on climate policy in IQ2 debate here: full debate: https://www.youtube.com/watch?v=Sc7KsgZt0TQ; edited version: https://www.youtube.com/watch?v=aoxmJe1OgYk. Professors Freeman & Lazarus break down marathon day of oral argument in DC Circuit over legality of Obama's Clean Power Plan here. Professors Freeman & Lazarus explain EPA’s Clean Power Plan (the Obama policy to curb GHG pollution from the power sector), here. To see Professor Freeman and Professor Lazarus discuss the Supreme Court's Environmental Law and Energy Cases from the 2014 and 2015 terms, go here. For Professor Freeman’s analysis of the legal defensibility of the President’s Clean Power Plan, go here: Politico; For an explanation on why utilities will benefit from it, here: NYT piece; and for an assessment of its legal and political prospects, here: Guardian piece. For an extensive interview on the plan’s impact, listen here: public radio interview (scroll to Freeman segment). For an NPR interview on International Climate Negotiations and US-China Deal, go here: Takeaway Piece . Jody Freeman & David Spence, Old Statutes, New Problems, 163 U. Pa. L. Rev. 1 (2014). Global Climate Change and U.S. Law (Jody Freeman & Mike Gerrard eds., A.B.A. 2d ed. 2014). Jody Freeman & Jim Rossi, Agency Coordination in Shared Regulatory Space, 125 Harv. L. Rev. 1131 (2012). Jody Freeman, The Limits of Executive Power: The Obama-Trump Transition, 96 Neb. L. Rev. 545 (2018). Jody Freeman, Don’t Roll Back Vehicle Fuel Standards, N.Y. Times, Mar. 8, 2017, at A23. An editorial is presented on U.S. Donald Trump administration's attempt to rollback fuel efficiency standards for vehicles set by former President Obama and it states it is a retrograde step as the standards were set based on available technologies and to protect the environment. Jody Freeman, The Uncomfortable Convergence of Energy and Environmental Law, 41 Harv. Envtl. L. Rev. 339 (2017). Environmental law and energy law, two historically disparate fields, seem to be converging. Energy regulation has begun to seriously address environmental concerns for the first time, and environmental law is increasingly becoming a driver of energy policy. This Article describes the legal mechanisms through which greater congruence has been achieved, while acknowledging the still significant and stubborn barriers to true integration, which likely will be difficult to overcome. It shows that federal agencies have taken steps toward greater policy alignment by repurposing existing statutory provisions and relying on previously under-utilized legal authorities for the first time, in a carefully calibrated process of legal innovation. Yet it also shows this process to be meaningfully constrained by the agencies' adherence to their own distinct missions, and by the constraints of their particular statutory authorities. The Article builds on the work of scholars who have lamented the divide between energy and environmental law, and urged that it be dismantled. Most of the accounts to date suggest that environmental rules and energy sector regulation, which are so obviously interrelated, inevitably will be drawn closer together. The analysis here looks more closely at the drivers of convergence to date, and presents a more nuanced picture of events. The trend toward greater policy alignment, while real, is limited. Energy and environmental regulators have not embraced convergence as an independent goal, but rather have achieved it incrementally and indirectly, as a consequence of pursuing their traditional missions during a time of change. These agencies have reacted to numerous external forces--technological innovation, market shifts, scientific developments, federal and state regulatory measures--which have prompted them to respond with their own initiatives. Yet they remain constrained by the bounds of their governing statutes and the confines of their long established regulatory roles. Tellingly, these agencies have tended to justify their policy innovations as necessary to fulfill their own traditional mandates, not to help other agencies realize theirs. The Article ultimately concludes that claims of convergence between the two fields should be tempered. However desirable greater policy congruence might be, it has not been mandated by Congress, explicitly commanded by the President, or centrally directed by anyone else. And it is not inevitable. The most that can be said is that convenient alignments may arise when the imperatives of these different regulators coincide. Thus, the story of “convergence” between energy and environmental goals is one of gradual steps rather than great leaps--of interest-based compatibility rather than love-struck merger. Jody Freeman, A Critical Look at “The Moral Case For Fossil Fuels”, 36 Energy L.J. 327 (2015). Jody Freeman & Kate Konschnik, A Climate Plan Businesses Can Like, N.Y. Times, Aug. 4, 2015, at A23. Ronald A. Cass, Colin S. Diver, Jack M. Beermann & Jody Freeman, Administrative Law: Cases and Materials (Wolters Kluwer 7th ed. 2015). This outstanding author team presents administrative law as a vital force in policymaking, law enactment, and politics. Look for these key features of the new edition: • Addition of important new cases on recess appointments, Chevron Step Two, “Seminole Rock” deference, occupational licensing, and FOIA Exemption 2. • Substantial enrichment of materials on formal adjudication under the APA. • Splitting of the policymaking chapter into two chapters (choice of policymaking instruments and rulemaking) for greater clarity and teaching flexibility. • Updating and streamlining of the materials on licensing. • Presentation of important classic and secondary cases in squib format. • Substantial streamlining, condensing, and reorganizing of background notes. William W. Buzbee, Ann E. Carlson, Megan M. Herzog, Jody Freeman, Richard J. Lazarus, Thomas O. McGarity, Craig N. Oren, Richard L. Revesz & Cecilia Segal, Climate Regulation Under the Clean Air Act in the Wake of Utility Air Regulatory Group v. EPA, 39 Harv. Envtl. L. Rev. 1 (2015). Jody Freeman, Why I Worry About UARG, 39 Harv. Envtl. L. Rev. 9 (2015). Jody Freeman, Teaching an Old Law New Tricks, N.Y. Times, May 30, 2014, at A27. Jody Freeman & Kate Konschnik, U.S. Climate Change Law and Policy: Possible Paths Forward, in Global Climate Change and U.S. Law 795 (Jody Freeman & Michael B. Gerrard eds., A.B.A. 2nd ed. 2014). This comprehensive, current examination of U.S. law as it relates to global climate change begins with a summary of the factual and scientific background of climate change based on governmental statistics and other official sources. Jody Freeman, Network Federalism (Nov. 18, 2013). Jody Freeman, Op-Ed., Obama Must Walk a Climate Tightrope, L.A. Times, July 9, 2013. Jody Freeman, Op-ed., Should the Federal Government Regulate Fracking?, Wall St. J. , Apr. 14, 2013. Jody Freeman, Op-ed., The Wise Way to Regulate Gas Drilling, N.Y. Times, July 5, 2012. Jody Freeman & Jim Rossi, Improving Coordination of Related Agency Responsibilities (Vand. Pub. L. Res. Paper No. 13-8, May 30, 2012). Interagency coordination is one of the great challenges of modern governance. This Report, prepared for the Administrative Conference of the United States (ACUS), highlights the challenges presented by fragmented agency responsibilities. Rather than oppose all agency fragmentation, the Report highlights instances when it presents governance problems and describes the variety of tools that Congress, the President, and agencies may use to manage coordination challenges more effectively. These tools include agency interaction requirements, formal interagency agreements, and joint policymaking. This Report also assesses the relative strengths and weaknesses of these coordination tools using the normative criteria of efficiency, effectiveness, and accountability, and it concludes that the benefits of coordination will frequently be substantial. To varying extents, these instruments can reduce regulatory costs for both government and the private sector, improve expertise, and ameliorate the risk of bureaucratic drift without compromising transparency. Coordination can also help to preserve the functional benefits of shared or overlapping authority, such as promoting interagency competition and accountability, while minimizing dysfunctions like discordant policy. Building on the existing literature, and past proposals of organizations like ACUS, the Report recommends a comprehensive executive branch effort to promote stronger interagency coordination and improve coordination instruments. The Report also recommends some more targeted reforms designed to promote coordination and its benefits, including development of agency policies on coordination, sharing of best practices, ex post evaluation of at least a subset of coordination processes, and tracking of outcomes and costs. These reforms could be adopted in a new Executive Order on agency coordination; added as amendments to existing Executive Order 12866 or 13563; adopted as part of the Office and Mangement and Budget’s implementation of the Government Performance and Results Act; or prescribed by Congress via statute. Agencies might also voluntarily adopt a number of these reforms. This Consultants' Report served as a background for ACUS Recommendation 2012-5, "Improving Coordination of Related Agency Responsibilities," adopted on June 15, 2012. Jody Freeman, Climate and Energy Policy in the Obama Administration, 30 Pace Envtl. L. Rev. 375 (2012). Jody Freeman & Andrew Guzman, Climate Change and U.S. Interests: Reply to Responses, 41 Envtl. L. Rep. 10726 (2011). Jody Freeman, The Obama Administration's National Auto Policy: Lessons from the "Car Deal", 35 Harv. Envtl. L. Rev. 344 (2011). Jody Freeman, Op-ed., The Good Driller Award, N.Y. Times, July 1, 2010, at A31. Daniel A. Farber, Jody Freeman & Anne Carlson, Cases and Materials on Environmental Law (West Acad. Publ'g 8th ed. 2009). The Eighth Edition provides up-to-date treatment of climate change issues. Jody Freeman & Andrew T. Guzman, Sea Walls are Not Enough: Climate Change and U.S. Interests (U.C. Berkeley Public Law Research Paper No. 1357690, Mar. 12, 2009). The public policy debate on the appropriate American response to climate change is now in full swing. There are no longer significant voices disputing that climate change is real or that it is primarily the result of human activity. The issue today is what the United States should do about climate change given the risks the country faces and the likely economic impacts. The question is whether putting a price on carbon domestically is worth the cost. In this Article we make the case that the United States should act aggressively to mitigate the effects of climate change. In doing so we take on and debunk the "climate change winner" argument, which asserts that the United States is likely to fare well in a warmer world, at least compared to most other states and, therefore, faces no rational incentive to invest in expensive mitigation efforts that will largely benefit other states. In this view, impacts on the United States are best addressed through a strategy of adaptation rather than mitigation - the construction of both literal and figurative sea walls to reduce the effects of global warming. The dominant response to this argument has been an appeal to a perceived moral obligation on the United States based on its wealth and its historical greenhouse gas emissions. Though we are sympathetic to this moral argument, this Article takes a different approach. We demonstrate that even if one accepts that the premises of the climate change winner argument - that impacts on the United States will be less severe than elsewhere and that the United States is not morally obliged to help foreign states - the case for American action on climate change is strong. Considering only the narrow self-interest of the United States, we show that the climate change winner argument is wrong. We explain that existing estimates systematically underestimate the likely economic impact of climate change, and we provide rough estimates of what a more complete accounting would reveal. The sources of downward bias in existing models are numerous and include undue optimism about future warming, overlooked asymmetries around expected increases in temperature, and a failure to account for catastrophic events, non-market costs, cross-sectoral impacts, and impacts on productivity. Also ignored by existing estimates are the ways in which climate change impacts abroad will spillover into the United States through economic effects, national security, migration and disease, creating additional costs. This Article shows that climate change is not simply a problem for the rest of the world. It is far likelier than current models suggest to lead to serious negative consequences for the United States. If this is so, the country should take prompt and aggressive action to address climate change, not out of benevolence or guilt, but out of simple self-interest. Jody Freeman & Andrew Guzman, Climate Change and U.S. Interests, 109 Colum. L. Rev. 1531 (2009). See also, 41 Envtl. L. Rep. 10695 (2011). The public policy debate on the appropriate American response to climate change is now in full swing. There are no longer significant voices disputing that climate change is real or that it is primarily the result of human activity. The issue today is what the United States should do about climate change given the risks the country faces and the likely economic impacts. The question is whether putting a price on carbon domestically is worth the cost. In this Article we make the case that the United States should act aggressively to mitigate the effects of climate change. In doing so we take on and debunk the “climate change winner” argument, which asserts that the United States is likely to fare well in a warmer world, at least compared to most other states and, therefore, faces no rational incentive to invest in expensive mitigation efforts that will largely benefit other states. In this view, impacts on the United States are best addressed through a strategy of adaptation rather than mitigation – the construction of both literal and figurative sea walls to reduce the effects of global warming. The dominant response to this argument has been an appeal to a perceived moral obligation on the United States based on its wealth and its historical greenhouse gas emissions. Though we are sympathetic to this moral argument, this Article takes a different approach. We demonstrate that even if one accepts that the premises of the climate change winner argument – that impacts on the United States will be less severe than elsewhere and that the United States is not morally obliged to help foreign states – the case for American action on climate change is strong. Considering only the narrow self-interest of the United States, we show that the climate change winner argument is wrong. We explain that existing estimates systematically underestimate the likely economic impact of climate change, and we provide rough estimates of what a more complete accounting would reveal. The sources of downward bias in existing models are numerous and include undue optimism about future warming, overlooked asymmetries around expected increases in temperature, and a failure to account for catastrophic events, non-market costs, cross-sectoral impacts, and impacts on productivity. Also ignored by existing estimates are the ways in which climate change impacts abroad will spillover into the United States through economic effects, national security, migration and disease, creating additional costs. This Article shows that climate change is not simply a problem for the rest of the world. It is far likelier than current models suggest to lead to serious negative consequences for the United States. If this is so, the country should take prompt and aggressive action to address climate change, not out of benevolence or guilt, but out of simple self-interest. Jody Freeman & Adrian Vermeule, Massachusetts v. EPA: From Politics to Expertise, 2007 Sup. Ct. Rev. 51 (2008). J. R. DeShazo & Jody Freeman, Timing and Form of Federal Regulation: The Case of Climate Change, 155 U. Pa.. L. Rev. 1499 (2007). Jody Freeman, Extending Public Accountability Through Privatization: From Public Law to Publicization, in Public Accountability: Designs, Dilemmas and Experiences 83 (Michael L. Dowdle, ed., Cambridge Univ. Press, 2006). In this chapter, I suggest a counterintuitive way to view American privatization trends. Instead of seeing privatization as a means of weakening the state and reducing public accountability, I imagine it as a mechanism for expanding public accountability's reach into realms traditionally thought private. In other words, privatization can be a means of "publicization," a process through which private actors increasingly commit themselves to traditionally public goals as the price of access to lucrative opportunities to deliver goods and services, and to perform functions that might otherwise be provided directly by the state. Rather than compromising democratic norms of accountability, due process, equality, and rationality -- as some critics of privatization fear it will -- privatization might extend these norms to private actors through the judicious use of legislative, executive, judicial, and even social oversight. Jody Freeman & Charles D. Kolstad, Moving to Markets in Environmental Regulation: Lessons from Twenty Years of Experience (Oxford Univ. Press 2006). Over the last decade, market-based incentives have become the regulatory tool of choice when trying to solve difficult environmental problems. Evidence of their dominance can be seen in recent proposals for addressing global warming (through an emissions trading scheme in the Kyoto Protocol) and for amending the Clean Air Act (to add a new emissions trading systems for smog precursors and mercury--the Bush administration's "Clear Skies" program). They are widely viewed as more efficient than traditional command and control regulation. This collection of essays takes a critical look at this question, and evaluates whether the promises of market-based regulation have been fulfilled. Contributors put forth the ideas that few regulatory instruments are actually purely market-based, or purely prescriptive, and that both approaches can be systematically undermined by insufficiently careful design and by failures of monitoring and enforcement. All in all, the essays recommend future research that no longer pits one kind of approach against the other, but instead examines their interaction and compatibility. This book should appeal to academics in environmental economics and law, along with policymakers in government agencies and advocates in non-governmental organizations. J.R. DeShazo & Jody Freeman, Public Agencies as Lobbyists,105 Colum. L. Rev. 2217 (2005). Jody Freeman, The Story of Chevron: Environmental Law and Administrative Discretion, in Environmental Law Stories (Richard Lazarus & Oliver Houck eds., Found. Press 2005). Jody Freeman & Daniel A. Farber, Modular Environmental Regulation, 54 Duke L.J. 795 (2005). J.R. DeShazo & Jody Freeman, The Congressional Competition for Control of Delegated Power, 81 Tex. L. Rev. 1443 (2003). In this Article, we challenge the "monolithic view" of Congressional control over delegated power, which assumes that oversight committees will enforce the wishes of an enacting majority. In contrast with this prevailing view we argue that Congress consists of rivals who compete for control over power delegated to agencies. Individual committee members with access to oversight tools vie for control over agencies, both with each other and with past enacting majorities, to further their own interests. We argue, contrary to the conventional understanding, that committee members sometimes defy majority preferences rather than reinforce them. We claim that Congress creates an internal accountability problem when it delegates oversight power to its committees, just as it creates a problem of control when it delegates administrative power to agencies. Indeed, one delegation might exacerbate the other. And together, this "double delegation" creates a significant risk that agency decision making will be driven by the interests of small sub-majorities of Congress, and that this influence will subvert statutory commands. Playing off Bickel's famous characterization of the judiciary, we call this problem the "sub-majoritarian difficulty." Sub-majoritarianism may be so severe as to re-introduce parochialism into the implementation of federal statutes meant to impose national solutions - a phenomenon we call "backdoor federalism." We support our theoretical argument with an empirical test of decision making by the US Fish and Wildlife Service. In the literature on delegated power, our argument shifts the question from how best to make administrative agencies accountable to Congress, to who ought to be the principal, given the viability of multiple legislative principals. We speculate about how political scientists and legal scholars, respectively, might react to this competition among principals, and we explore measures that might minimize the adverse effects of sub-majoritarianism. Jody Freeman & Laura Langbein, Regulatory Negotiation and the Legitimacy Benefit, 9 N.Y.U. Envtl. L.J.. 60 (2001). Reprinted in 31 Envtl. L. Rep. 10811-51 (2001). Jody Freeman, The Contracting State, 28 Fla. St. U. L. Rev. 155 (2001). n this article, Professor Freeman argues that contract is an increasingly important administrative and regulatory instrument, with significant implications for administrative law. She focuses on two species of contract-contracts to provide services or benefits (already well entrenched in the United States) and regulatory contracts (a nascent, but noteworthy, development) and argues that, in an era of widespread contracting out and devolution, and at a time of increasing experimentation with contracts as regulatory instruments, the pressure for government/private contracts to absorb public law norms of fairness, rationality and accountability will intensify. Conceptually, she claims, government/private contracts of both sorts force an uncomfortable interface between private and public law. They pose a host of doctrinal and theoretical problems for which administrative law provides no ready answers. Despite their significant risks, however, Professor Freeman suggests that government/private contracts might have significant benefits that we ought not to overlook. Indeed, contracts themselves can be potentially crucial accountability mechanisms in an era of greater private involvement in administration and regulation. They could, for example, allow third party beneficiaries to hold the contracting parties accountable for their commitments. Moreover, contracts may enable government agencies to accomplish indirectly, what, for legal or political reasons, they cannot achieve directly. As with grants in aid between the federal and state governments, public/private contracts could be a means of extending government priorities and policies to private actors, and of exacting concessions and gains that might otherwise be beyond its regulatory reach. Under the right circumstances Freeman argues, regulatory contracts could prove more -- or at least no less -- effective and democratic, than other regulatory instruments. The rise of contract may therefore signal not so much the retreat of the state, as a reconfiguration of the state's role in governance. That reconfiguration could conceivably amount to a net gain in accountability, or at least not a net loss. Jody Freeman, Environmental Supplement, in Encyclopedia of the American Constitution (Leonard W. Levy, Kenneth L. Karst et al. eds., 2nd ed. 2000). Jody Freeman, Private Parties, Public Functions and the New Administrative Law, in Recrafting the Rule of Law: The Limits of Legal Order 331 (David Dyzenhaus ed., 1999). This collection of essays on the rule of law focuses on the traditional question whether the rule of law is necessarily the rule of moral principles, the question of the legitimacy of law. Jody Freeman, Collaborative Governance in the Administrative State, 45 UCLA L. Rev. 1 (1997). This paper argues that the discretion-constraining impulses of most regulatory reinvention efforts fail to respond to the most serious weaknesses of rulemaking, implementation and enforcement. This is partly because reformers are encumbered by the theory and practice of interest representation and partly because administrative law lacks an alternative model of administrative decision making. The paper's purposes are threefold: (1) to offer a normative vision of collaborative governance against which to evaluate proposals for reform. Collaboration requires problem-solving, provisional solutions, broad participation, public-private sharing of responsibility and a flexible, engaged agency. (2) to illustrate how some innovative administrative processes, such as regulatory negotiation and negotiated permitting, embody elements of the collaborative model and to explain why, despite their promise, they fall short of the collaborative ideal. As examples, the paper relies on four case studies, two each of regulatory negotiation and EPA's Project XL. (3) to argue that the pursuit of collaboration requires a willingness to experiment with non-traditional source of accountability in order to address the problem of legitimacy.